Where can you see a “Spectacle Of Art” Show highlighting award winning artists, a photography and painting exhibit of a 4th generation Floridian, and meet the artists at a free event? 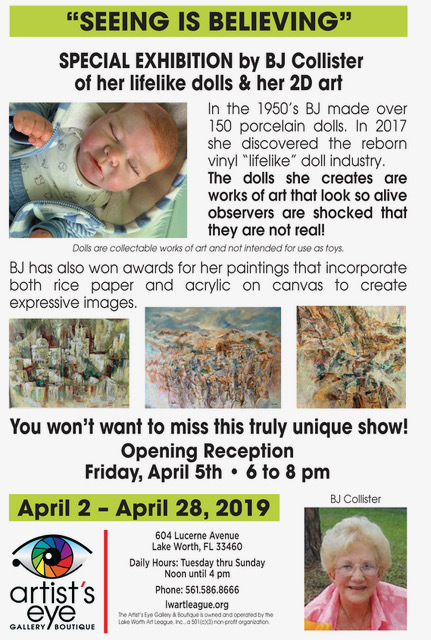 The Artist’s Eye Gallery & Boutique, the home of the Lake Worth Art League, invites the public to their 6th exhibit Opening Reception on Friday, March 1. The Rickie Report shares the details and some sneak peeks. The exhibits are available through March 31. Shop the Boutique! Enjoy the City of Lake Worth Block Party! ART LOVERS! Save the dates! You are invited to our “Spectacle Of Art” show! It’s the 6th of 8 judged art exhibitions in our Eye-Catching Season of Art, and our second season show that is open to all artists! Our featured artist is a fourth generation Floridian that loves the beaches, rivers and the Everglades. 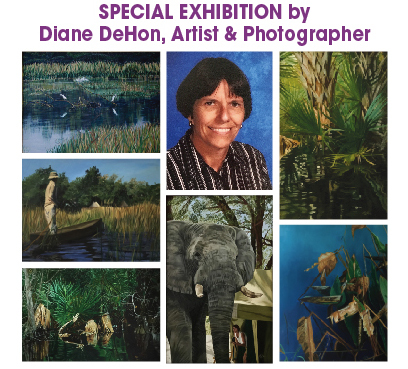 Mesmerized by the animals, flora, water and their interaction with each other, the colors, the peacefulness and the geometrical shapes that can be seen in the plants, Diane is driven to capture that uniqueness and wonder as both a photographer and a painter. during the City of Lake Worth Block Party. Just steps off Lake Avenue, at L Street and Lucerne Avenue, our Exhibits and Receptions are open to the public. Receptions offer an opportunity to MEET THE ARTISTS, enjoy light refreshment, and shop in our Boutique for unique items created by our artists! This show begins February 26, 2019 and may be seen through March 31 from Noon to 4 pm. 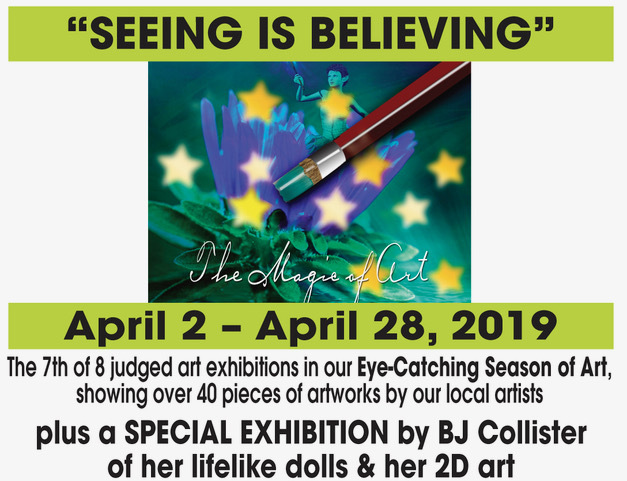 The Artist’s Eye Gallery and Boutique will present “Artistic Perceptions”, it’s latest judged show in their “Eye-Catching Season of Art” series. The public is invited to this free exhibit’s Opening Reception on February 1st. The Exhibit is available from January 29 through February 24. How do you think about something using one of your senses? Come into the Gallery to note YOUR perception of each piece and cast your ballot for the People’s Choice Award! 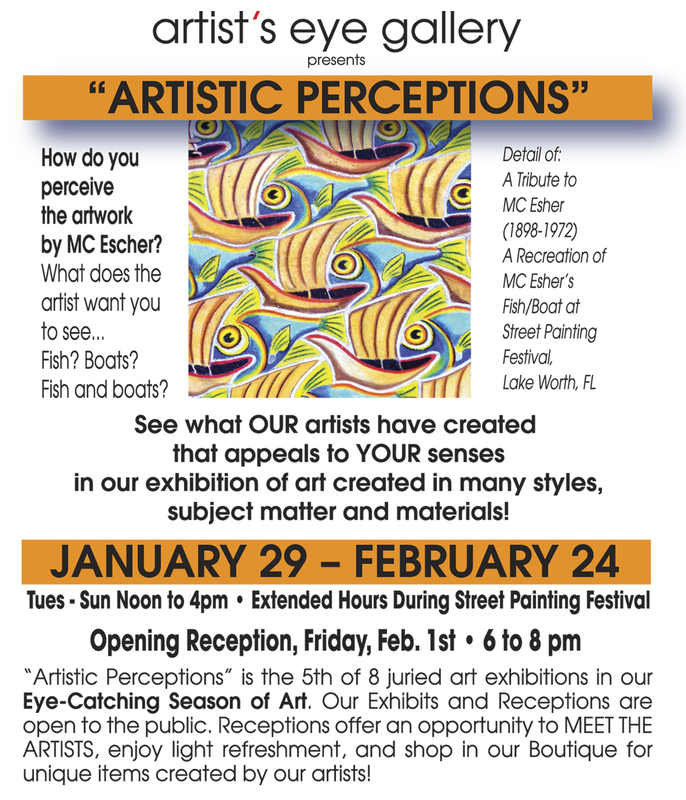 Stop by the Lake Worth Street Painting Festival on February 23-24 and enjoy the Gallery’s special OUTDOOR SHOW! The CALL to ARTISTS for “A Spectacle of Art” is open to all artists. The Rickie Report shares all the details here. 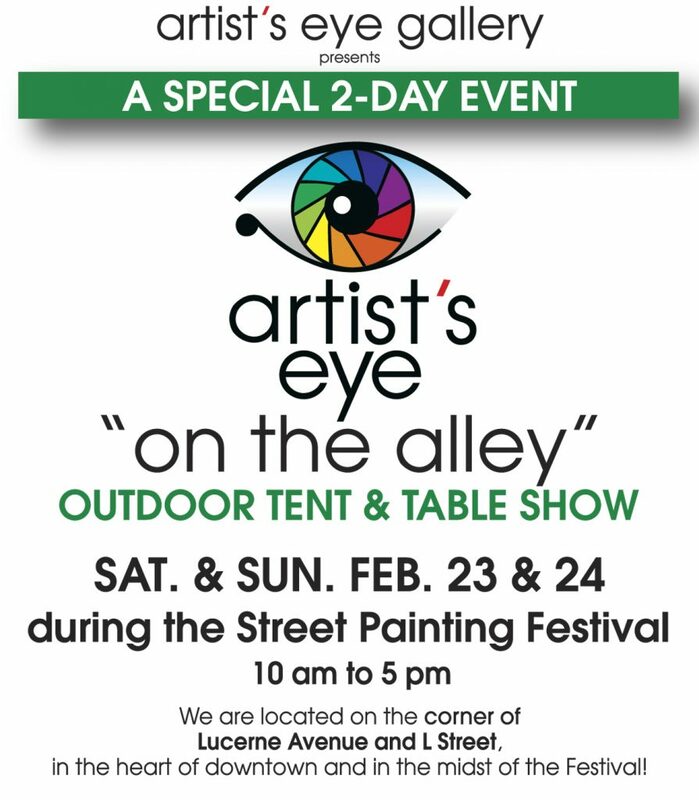 You’re invited to our special OUTDOOR ART SHOW, Artist’s Eye “On The Alley” during the Lake Worth Street Painting Festival, Saturday, February 23rd & Sunday, February 24th from 10 am to 5 pm. We are located at 604 Lucerne Ave, (Lucerne and L Street) right in the midst of the festival. While you are there, we welcome you inside our Gallery too, to see the art in our latest judged fine art show “Artistic Perceptions”and to shop in our Boutique for unique items created by our artists! An invitation to exhibit your work in our last OPEN SHOW of the season. This is a judged show, with cash and ribbon prizes for First, Second, Third & Honorable Mention. The people decide on the last prize, The People’s Choice Award, which gains the winner a ribbon and artist to show the work again in the next show for free. Entry Fee is $30. for the first piece and $15. each additional up to five pieces. Please go to the web site lwartleague.org to review the rules for participation and framing requirements. Take-in is from 10am to 2pm, on Monday, February 25, 2019. Opening Reception, Friday, March1, from 6 to 8 pm. Take-down is Monday, April 1, 2019 from10am to 2pm. 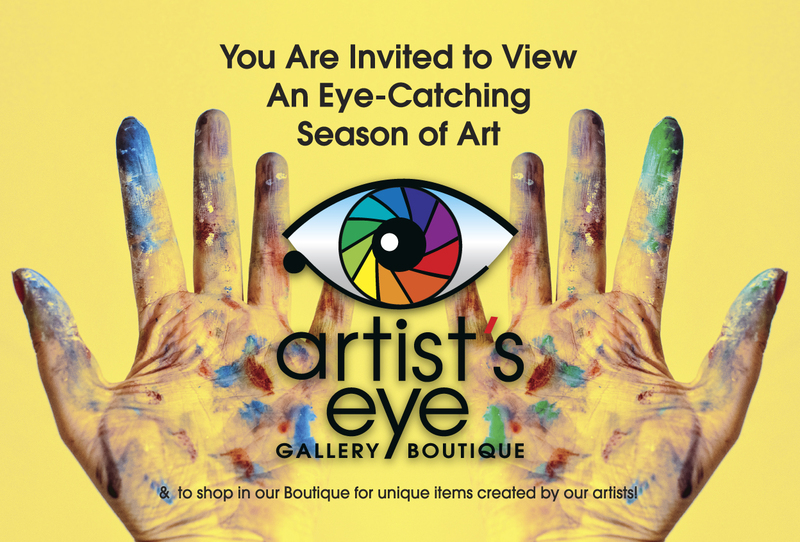 Artists’ Eye Gallery And Boutique Features Jeanne Rossi And Invites Emerging To Professional Artists To Join The Group! 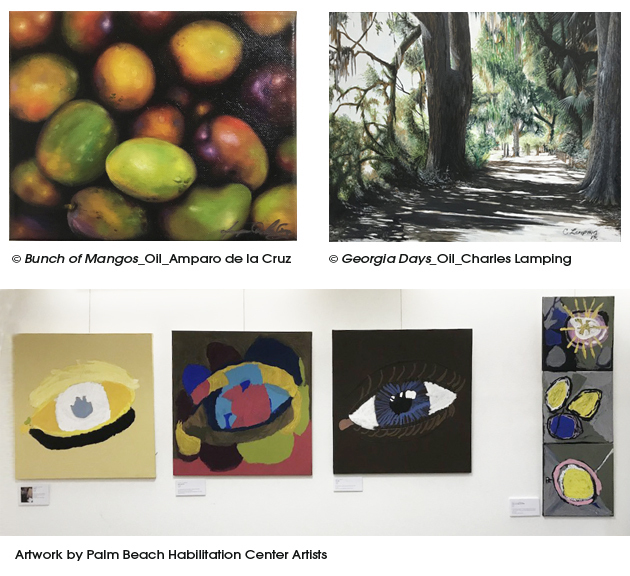 The Lake Worth Art League invites the public to the Free, Opening Reception , “In The Eyes Of The Beholder”, the fourth judged show of eight, in their Eye-Catching Season of Art! On Friday, January 4 visit the gallery and tell us what you see! What attracts you to a certain piece of artwork? 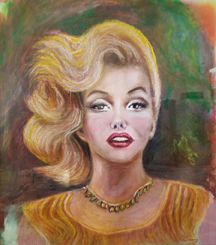 See the fashionable artistry of Featured Artist, Jeanne Rossi, who has a particular affinity to Marilyn Monroe. In addition, The Rickie Report shares a Call to All Artists to exhibit your work at the gallery, an unprecedented equal opportunity for all artists, from emerging to professional. 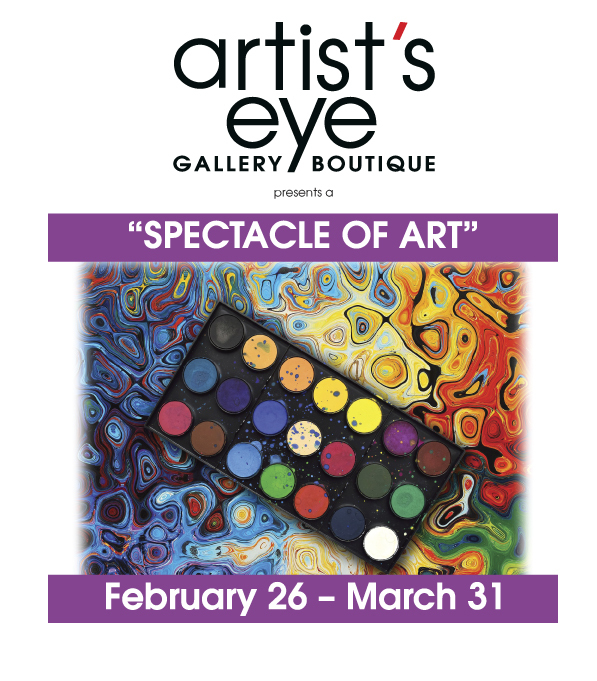 Take-in for the next Open Show, “Spectacle of Art” is February 25th. Get the details and sneak peeks here. 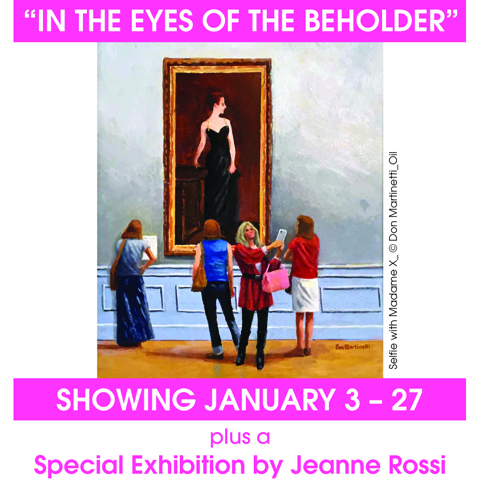 “In The Eyes Of The Beholder” is our 4th judged show of 8 in our Eye-Catching Season of Art. A beholder is someone who sees or otherwise experiences things, becoming aware of them. Not all people have the same opinions about what is attractive. In art, beauty is subjective; and to some, a piece of art being beautiful itself may not warrant one’s attention, but may attract them in other ways; via emotions, skill, colors or subject. Come and see our artist’s work in this show and see what you see. Will you agree with the judge? Along with a Special Exhibition by artist Jeanne Rossi, there will be much to behold. We know you will enjoy the show! Jeanne Rossi always had a passion for fashion and painting. She continues to paint beautiful, fashionable ladies, today, yet they all depict a sense of searching outside of themselves that convey a sense of pain and uncertainty that she feels prevails in most women. Jeanne especially enjoys portraying Marilyn Monroe and has titled her exhibition “A Tribute to Marilyn”. Show your work in our gallery! We are proud to offer an unprecedented equal opportunity for all artists! We are unique in that fact that we accept the work of ALL artists, from emerging to professional, to show, sell and compete for awards in our newly refurbished Artist’s Eye Gallery and Boutique in downtown Lake Worth. Our gallery is owned and operated by the Lake Worth Art League, the oldest non-profit art organization in Palm Beach County, founded in 1941. The league is comprised of very talented artists from all disciplines. More good news… it is very inexpensive to join and show. First, become a member for just $75. per year. You then have the opportunity to show up to 5 pieces of work in each one of our 8 judged “season” shows. Each show is judged by a qualified judge that is not affiliated with the league. The League offers cash prizes and ribbons for first, second, third, and honorable mention award winners. We also have a “Peoples Choice” award where the public is the judge! Entry fee for each show is $20. For first entry and $10. For each additional piece. Summer exhibitions continue with reduced prices for entry. The league retains 20% of all sales, which along with membership, entry fees and our volunteers, helps keep the gallery open and your work visible to the public. A reception with light refreshment is held for each show. All shows are advertised. We also hold shows throughout the summer! Membership offers discounted classes, social events and the opportunity to sell your work in our Boutique. Still skeptical? We are presenting our last open show the year, where you do not have to be a member to participate; with just a slightly higher entry fee, ($30. first entry, $15 each additional). Please go tolwartleague.org to view the rules for exhibition.Take-in for this show, “Spectacle of Art” is Mon. Feb. 25th from 10:00 am to 2:30 pm. Here are just two of the award winning works of art from our last show “Look, See, Think”, along with some of the art from our Special Exhibition of the Palm Beach Habilitation Center artists. The Artist’s Eye Gallery & Boutique presents two thought provoking exhibits in December. “Look, See, Think” is the Gallery’s 3rd of 8 judged shows in their “Eye-Catching Season of Art”. A special exhibition of the Artists of the Palm Beach Habilitation Center’s Personal Arts and Creative Expression (PACE) Program enhances the feelings of sharing on the holidays. Enjoy the free Opening Reception on Friday, December 7th. Located in downtown Lake Worth, the Gallery also offers Jewelry Classes and Watercolor Classes. Shop for Holiday Gifts, including original art of various sizes, carved wood, ceramics, greeting cards, fashion jewelry, giclees, and prints. The Exhibits run December 4 through 30. The Rickie Report shares the details and some sneak peeks! The Artist’s Eye Gallery & Boutique presents two thought provoking shows from Dec. 4th thru 30th. “Look, See, Think”, is our 3rd of 8 judged shows in our “Eye-Catching Season Of Art”. 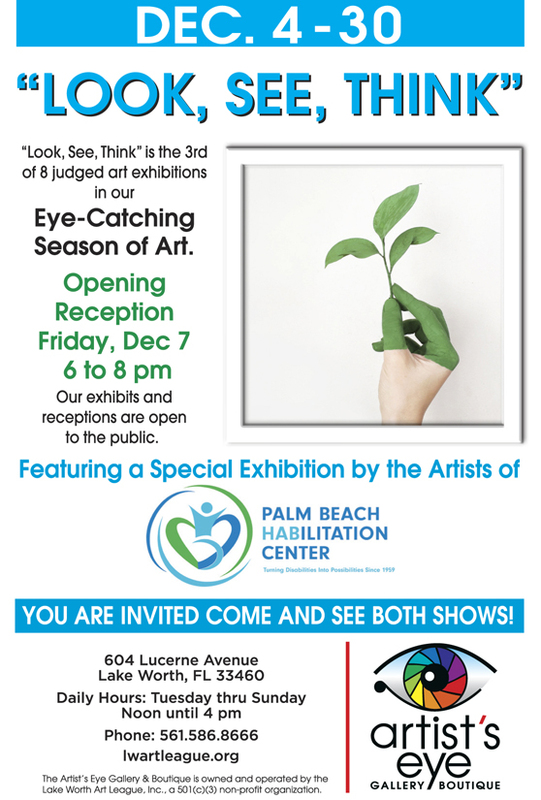 We are also proud to present a special exhibition of the Artists of the Palm Beach Habilitation Center’s Personal Arts and Creative Expression (PACE) Program. A wine & cheese reception will be held on Friday, Dec. 7th from 6 to 8pm to celebrate the opening of both shows! We are open to the public at no charge. December also kicks off our series of classes, beginning with Jewelry Making, and a Watercolor starts in January. Stop by the gallery for more information or go to lwartleague.org and click on the Classes tab. Lake Worth Art League shares an Open Call To Artists for “Visions”! (There will be no jewelry entries at this event). Artists, from emerging to established, are encouraged to enter this exhibit. What is your interpretation of “Visions”? This is the second of 8 judged art exhibitions in LWAL’s Eye-Catching Season of Art, and their first show that is open to all artists! “Meet the Artists” Opening Reception is on Friday, November 2nd at The Artists’ Eye Gallery on Lucerne Avenue. Enjoy light refreshments and shop in the Boutique for unique items created by artists who happen to live locally! This show begins October 30th and maybe seen through December 2nd. ART LOVERS! Save the dates! Kudos to LWAL for opening this Call up to everyone! The Rickie Report shares the details and urges artists to apply! 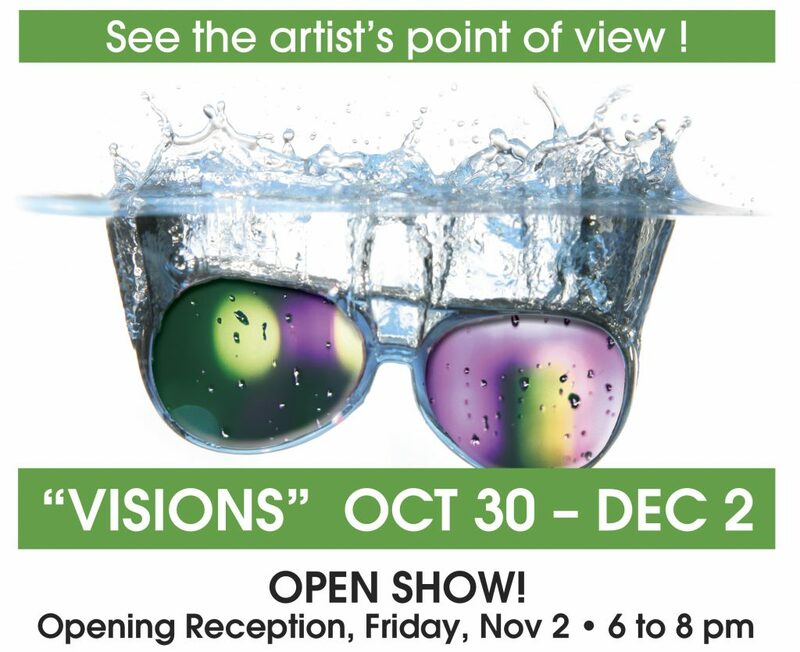 Join us for “VISIONS”, our 1st “Open” judged show of the season in Downtown Lake Worth. This show is professionally judged for ribbons and awards – art work is not juried for entry! Please go to lwartleague.org under the Rules tab to view Exhibition Rules for Open Shows. Our first show that is open to all artists! Our Exhibits and Receptions are open to the public. Receptions offer an opportunity to MEET THE ARTISTS, enjoy light refreshment, and shop in our Boutique for unique items created by our artists! This show begins October 30th and maybe seen through December 2nd. We offer two open shows per year, where you do not have to be a member to participate; with just a slightly higher entry fee, ($30. first entry, $15 each additional). Please go to lwartleague.org to view the rules for exhibition. Take-in for these two open shows: “Visions” show, Monday, October 29, 2018 and our “Spectacle of Art” show, Monday, February 25, 2019. Take-in is 10:00 am to 2:30 pm. Our gallery is owned and operated by the Lake Worth Art League, the oldest non-profit art organization in Palm Beach County, founded in 1941. The League is comprised of very talented artists from all disciplines. More good news… it is very inexpensive to join and show! Become a member for just $75. per year and you have the opportunity to show up to 5 pieces of work in each one of our 8 judged “season” exhibits. Each show is judged by a qualified judge who is not affiliated with the League. We offer cash prizes and ribbons for first, second, third, and honorable mention award winners. We also have a “Peoples Choice” award where the public is the judge! Entry fee for each show is $20. For first entry and $10. For each additional piece. Summer exhibitions continue with reduced prices for entry. The League retains 20% of all sales, which along with membership, entry fees and our volunteers, helps keep the gallery open and your work visible to the public. A reception with light refreshment is held for each show. Membership offers meetings, discounted classes, social events and the opportunity to sell your work in our Boutique. 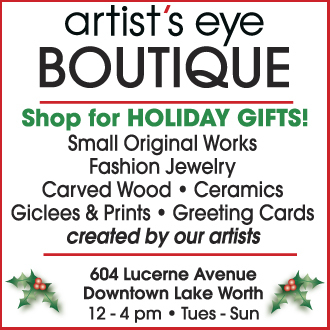 Lake Worth Art League Announces An “Eye Catching Season Of Art” At Artist’s Eye Gallery Boutique. Now Accepting Work From ALL Artists, Emerging To Professional! 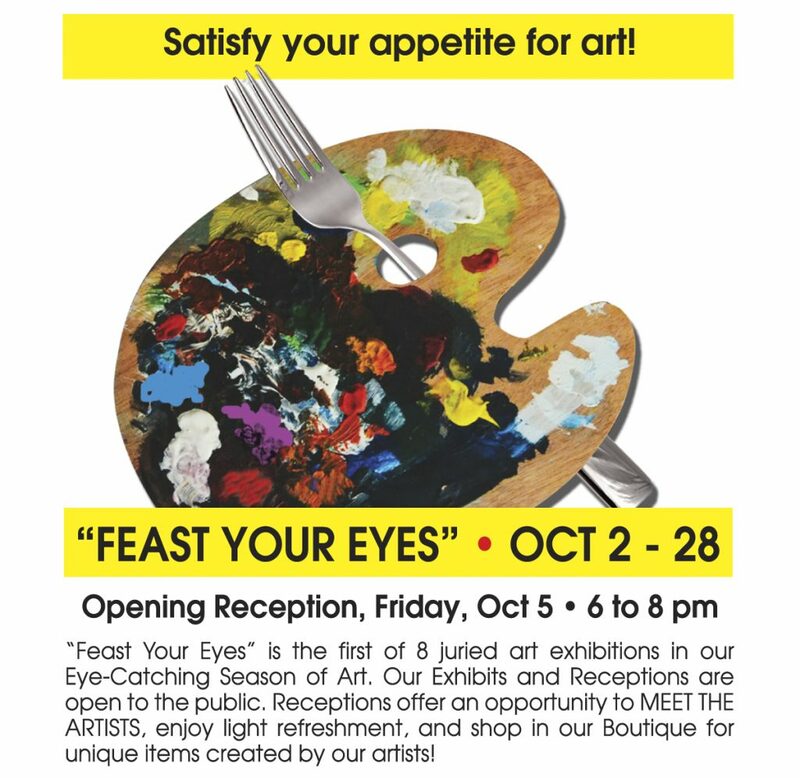 Artist’s Eye Gallery Boutique, the home of the Lake Worth Art League, announces its season kick off with the exhibit, “Feast Your Eyes”. The Opening Reception on Friday, October 5th is free and open to the public. The Gallery is also sending a Call to ALL artists, from emerging to professionally established, to join this encouraging environment. In addition to eight new judged exhibits throughout the season, visitors can browse the boutique. Meet the artists who happen to live locally, and are nationally and internationally recognized! The Rickie Report shares the details and a peek at some of the art. A new group of artist-leaders is bringing positive changes to Lake Worth’s art scene! Become a member for just $75. per year and you have the opportunity to show up to 5 pieces of work in each one of our 8 judged “season” exhibits. Each show is judged by a qualified judge who is not affiliated with the League. We offer cash prizes and ribbons for first, second, third, and honorable mention award winners. We also have a “Peoples Choice” award where the public is the judge! Entry fee for each show is $20. For first entry and $10. For each additional piece. Summer exhibitions continue with reduced prices for entry. The League retains 20% of all sales, which along with membership, entry fees and our volunteers, helps keep the gallery open and your work visible to the public. A reception with light refreshment is held for each show. All shows are advertised. We offer two open shows per year, where you do not have to be a member to participate; with just a slightly higher entry fee, ($30. first entry, $15 each additional). Please go to lwartleague.org to view the rules for exhibition. Take-in for these two open shows: “Visions” show, Mon. Oct 29 and our “Spectacle of Art” show, Mon. Feb. 25. Take-in is 10:00 am to 2:30 pm.